Sammi 7 provides support for scripting using the Python scripting language. Python is a popular and versatile scripting language that has active development and community support. More information regarding python can be obtained from its official website www.python.org. By embedding the python script interpreter and exposing various Sammi capabilities through python interfaces, Sammi 7 is provided with a set of new features. These new features improve different phases of the Sammi application development process, such as designing and creating displays, automating display testing, verifying pre-built displays, monitoring and debugging display data updates at runtime, etc. The sections Applications of Scripting and Roadmap provide a glimpse into the type of capabilities that can be achieved by leveraging these scripting interfaces in Sammi. The interfaces described below are used to interface with Sammi at Runtime and design time. Sammi Object Model (SOM)The SOM module is a critical component for exposing Sammi’s object model to python scripts. This module can be used with the Sammi Runtime, at design time and even with stand-alone python scripts. Although, the primary purpose of this module is to provide access to attributes associated with Sammi objects such as: displays, layer, shape, DDOs, composite, etc. Runtime Environment (RTE)The RTE module can be used at runtime (with s2_event process) or at design time (with s2_fred process). The module provides a method to process Sammi commands. It also provides a way to get a list of currently active plays in sammi. Format Editor (FE)The FE module can only be used at design time (with s2_fred process). The methods exposed via this interface are primarily for interaction with design time functionalities. The execute-script command was added for executing python scripts within Sammi. Just as the add-window command searches the folders specified in the SAM2_DATAFILE environment varaible for adding a display, the execute-script command will also use the SAM2_DATAFILE to search for the python script to execute. Key Features: The MDI interface, or multiple document interface, in Studio provides a container environment for the IDE. It is responsible for managing menus, toolbars, panels, dialogs, and mdi subwindows. It also acts as a controller for delegating specific responsibilityies/events from the displaydesigner to the appropriate widget/panel. The Role of Scripting: The script file $SAMMI/data_fe/mdi.py file is responsible for implementing these MDI responsibilities. Key Features: The menus and toolbars in Studio allows users to manage the display designer surface. The various icons for the menubar and toolbars are located in the $SAMMI/bin/mdi_imgs/toolbars folder. The Role of Scripting: The interaction between the display designer surface and menu/toolbar primarily occur using Sammi commands. The send_command method from the RTE module is used to execute display editor specific commands. The code for menubar and toolbar is implemented in $SAMMI/data_fe/mdi.py file. Key Features: The toolbox and shape panel in Studio allows user to create DDO and shape objects on the display designer surface. The interaction between the displaydesigner surface and menu/toolbar also primarily occurs using sammi commands. The $SAMMI/data_fe/toolbox.xml file is used to load the settings for the tool box panel. The $SAMMI/data_fe/toolpanel.xml file is used to load the settings for the shape panel. The images for these panels are loaded from $SAMMI/bin/mdi_imgs/toolbox and $SAMMI/bin/mdi_imgs/shapepanel folders. The Role of Scripting: The interaction between display designer surface and menu/toolbar also primarily happen using sammi commands. The functionalities are implemented in $SAMMI/data_fe/ddo_toolbox.py and $SAMMI/data_fe/shape_panel.py files. Key Features: The project explorer panel allows easy access to sammi project related files. The panel loads the content based on the SAM2_DATAFILE environment variable. 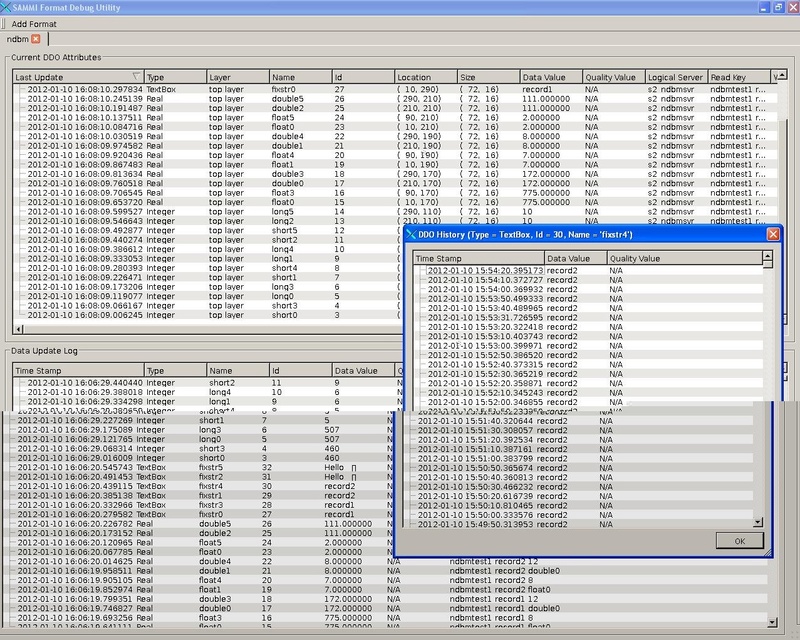 The project explorer panel presents a logical group of a Sammi project based on its file type. The search box in the panel allows easy searches for a particular file by name. The file is opened by double-clicking on the file. In addition to this, the files under the Components folder can be dragged and dropped to the display designer surface. The project explorer also provides a UI to load and unload displays/composites/vector symbols/ddo libraries. The Role of Scripting: These functionalities are implemented in $SAMMI/data_fe/proj_explorer.py file. The primary interaction of project explorer with sammi happens via sammi commands. Key Features: The data configuration panel allows easy access to configure data access properties for the selected DDO. As a DDO is selected on the display designer, the configuration panel loads the DDO’s data access properties into the panel. In addition to this, the panel also allows quick modification of the DDO name. The view tags option allows data access information to be loaded from pre-defined $SAMMI/data_fe/sammitags.config file. The Role of Scripting: The data configuration panel uses the SOM module to modify the ddo data access properties. The $SAMMI/data_fe/data_config_panel.py file is responsible for implementing these functionalities. Key Features: The layer dialog is responsible for providing a way to manipulate layer properties. 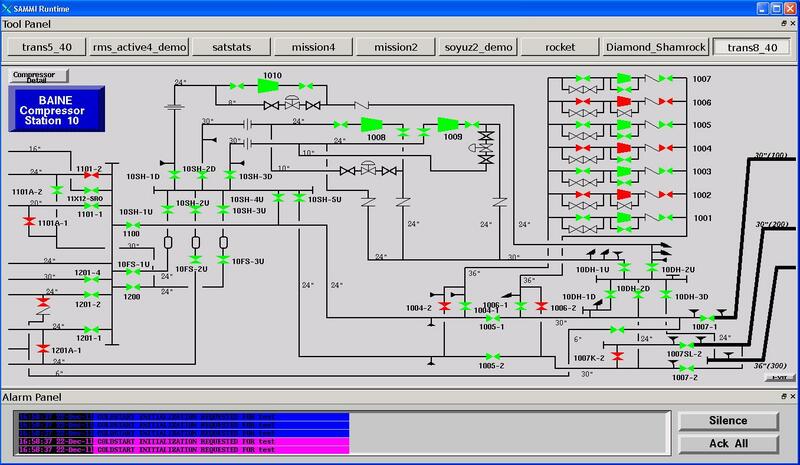 The Role of Scripting: The dialog uses Sammi commands and interfaces from the FE and SOM modules to access and manipulate layer properties for the format being edited. The $SAMMI/data_fe/layers_dialog.py file is responsible for implementing these functionalities. Key Features: The command window allows sammi commands to be executed. It also maintains a history of successful commands that were entered. The Role of Scripting: The $SAMMI/data_fe/cmnd_win.py file is responsible for implementing these functionalities. Key Features: The object explorer panel in Sammi Studio provides multiple functionalities. The primary objective of the object explorer is to allow objects to be searched by name. The object explorer contains two panels: the top panel and the bottom panel. The top panel presents the display hierarchy in terms of layers and composite objects. The bottom panel displays the children objects of selected component from the top panel. The top panel also allows quick manipulation of layer visibility and the ability to change the currently active layer. The bottom object search panel allows objects to be searched by name. In addition to this, the object type filter allows objects to be filtered by type as well. The object type filter also provides statistics regarding how many objects of a particular object type are present. The column based list view in the bottom panel allows objects to be sorted by name and column. In addition to this, when the object is selected on the list, the corresponding object is highlighted on the display designer and the Sammi pan command is used to pan the object to the top-left corner of the display designer surface. When working with large displays containing many small objects, it is sometimes difficult to figure out where the selected object is. In this situation, one can zoom into the display and then use the list view to select the object and format will pan to make it easier to see the object. Besides selecting an object via the list view, the object property dialogs can also be accessed by double clicking on the object in the list view. The property dialog can be used to modify the object. The object explorer panel also allows objects within the group/composite to be selected and manipulated. This feature provides a means by which the object within the group can be modified without having to perform ungroup and then regroup again. The Role of Scripting: The object explorer functionalities are implemented in $SAMMI/data_fe/fmt_object_explorer.py file. The file uses the Sammi object model in the SOM module and the FE module to access various format attributes for the format being edited. The SOM module provides a way to query display attributes and receive callbacks when a DDO’s runtime data buffer is updated. By using this information, one can automate various test scenarios for a given format. The examples section below provides illustrations of how to automate sammi display testing. This scripting feature can allow components in Sammi displays to be created programatically. The example below illustrates how shapes can progrmatically be added to a display in Sammi Studio. This allows import utilities to be created for various types of shape formats from other proprietary applications. This example illustrates how the display debug utility can be developed using Sammi scripting. The purpose of the utility is to monitor and debug display data updates at runtime. Overview: This example illustrates how scripting can be used at Runtime to process commands and gain access to display properties for currently active displays at Runtime. Execute ‘execute-script example1’ command in the command window. # sammi format object model from the som module is used to access format properties. #retreives the list of currently active formats in sammi runtime. Overview: This example illustrates how the sammi object model can be utilized at Runtime to get component information for a specific display. Execute ‘execute-script example2’ command in the command window. # the format name matches, the method returns the format instance. # Updates the component type dictionary with the object count. # dict_info – dict : the dictionary instance which will be updated with object count. # if a composite object is present then loop into the instance process its children. #add the about-win format using the add-window command. #get the about-win format instance. Overview: This example shows how layer information for a particular display can be accessed via scripting. The example uses the region_demo3 display. Execute ‘execute-script example3’ command in the command window. # the sammi object model. return None# Prints layer infomation related to given format instance. # fmt – Format : the format instance for which layer information needs to be printed. Overview: This example illustrates how DDO properties such as name, location, size, and data access information can be accessed using the sammi object model for a particular display. The example uses the ‘ndbm’ format. Execute ‘execute-script example4’ command in the command window. #Gets the data confguration properties associated with the ddo. #Check the data config type. # comp – CompositeObj : the composite object instance which needs to be queried to get ddos. Overview: This example illustrates how shape information can be obtained from a particular displau. The example uses the ‘fast_dobj’ format to periodically update the shape properties. Since the fast_dobj format controls these shapes using the dobj, the shape properties are dynamically updated. The example illustrates that the exposed sammi object model is able to provide status of the shape objects in real-time. Execute ‘execute-script example5’ command in the command window. # Given the shape instance, this method prints some shape properties. Overview: This example illustrates how Sammi scripting can be used to perform test automation for Sammi displays. Execute ‘execute-script example6’ command in the command window. # This example illustrates how scripting can be used to perform test automation in sammi runtime. # The example uses ndbm format as an example to illustrate how a particular format can be tested. return None# Return true if the ddo’s data buffer value matches with the expected value. Otherwise false is returned. # This method is called whenever the ndbm format is updated with data value update from the peer. # The method is responsible for checking to see if the ddo update occurred with the expected value. # only check for ddo update that we are interested in. #ddo check was complete, remove it from the list. # to the ddo_update_list so that it can be later checked to see if it received expected data value. # data – list : the first value in the list is a ddo name which will be updated with random data. #the peer may need to be modified so that it can deal with test specific commands. # This method is responsible to see if any of the ddo data update did not occur in expected time interval. # The method completes the test by closing the ndbm format. The ddo ‘short3’ was correctly updated with data value 179 as expected. The ddo ‘long3’ was correctly updated with data value 229 as expected. The ddo ‘float3’ was correctly updated with data value 817 as expected. The ddo ‘double3’ was correctly updated with data value 759 as expected. Overview: This example illustrates how the interface for the dobj ddo can be used to access it’s properties. This information can be used to perform test automation. Execute ‘execute-script example7’ command in the command window. # This example illustrates how to access the objects controlled by the dobj object. # the dobj object and the object that it controls. return None# The callback method that will be called whenever a ddo data update occurs. # ddo – Ddo : the ddo instance that has been updated. #Adds the ‘trans5_40’ format to the runtime. Overview: This example illustrates how the interface for the bitmap symbol DDO can be used to access it’s properties. This information can be used to perform test automation. Execute ‘execute-script example9’ command in the command window. # This example illustrates how to access properties for the bitmap symbol ddo. # the table name and symbol name associated with the ddo. return None#This callback will be called whenever a ddo receives a data update on the format. #Get the table and symbol name associated with the bitmap symbol ddo. #Add the ‘symbol_demo3’ format at runtime. #register for the data update event with the format. Overview: This example illustrates how the interface for the object icon DDO can be used to access it’s properties. This information can be used to perform test automation. Execute ‘execute-script example10’ command in the command window. # This example illustrates how to access properties for the object icon ddo. #Get the table and symbol name associated with the ddo. #Adds the the ‘objicon_demo3’ format at runtime. #Add data update callback to the format. Overview: This example illustrates how the interface for the text symbol DDO can be used to access its properties. This information can be used to perform test automation. Execute ‘execute-script example11’ command in the command window. # This example illustrates how to access properties for the text symbol ddo. #only process the text symbol ddo. #Add the ‘texttable_demo3’ format at runtime. #Add the data update event for the format. text symbol: table name = sampleafs , symbol name = Fisher! Overview: This example illustrates how shape animation can be performed using scripting in Sammi. The example adds the ‘trans3_40’ display at Runtime and changes the foreground color for polygons and lines at specific timer interval. Execute ‘execute-script example12’ command in the command window. # perform shape animation at runtime. 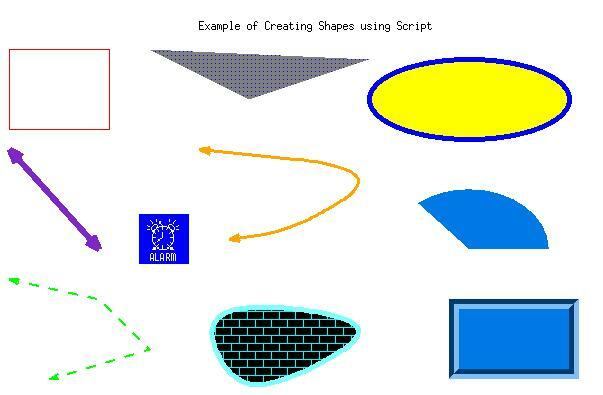 Overview: This example illustrates how scripting can be used to programmatically create shapes in Studio. This feature can be utilized to save significant time in format creation. It can also be used to create script that imports drawings from other proprietary applications. Go to View->Command Window to show the command window. Execute ‘execute-script create_shapes’ command in the command window. # This example shows how scripting can be used to progrmatically create shape objects in Studio. # active_lyr – LayerObj : the layer object instance in which to add new shapes. #Get the currently active format instance in FE. #Get the currently active layer instance. Overview: This example illustrates how scripting and the qt based PySide library can be used for creating SDI (Single Document Interface) using sammi displays. The example adds a button panel at the top and an alarm panel at the bottom. The middle panel is used for displaying sammi displays that are shown based on button selection on the button panel. Execute ‘execute-script rte_sdi’ command in the command window. Overview: This example illustrates how the sammi object model and scripting can be used to create a utility for debugging data updates for a display at runtime. The example uses the PySide library for creating an MDI interface and the exposed Sammi interfaces to collect display data at Runtime. Execute ‘add-window ndbm’ command in the command window to add a format. Execute ‘execute-script format_debug_util’ command in the command window to display the utility application. Click on the ‘Add-Format’ button to see list of active formats. The following features are currently under consideration for enhancing Sammi using python scripting. Currently the SOM module exposes interfaces for accessing attributes for Displays, Layers, Shapes and DDOs. The attributes for shapes and layers are fully exposed but the DDO only exposes common attributes. The specific attributes for each DDO needs to be exposed for the sammi object model to be complete. Furthermore, exposing various events specific to the ddo will make the object model more versatile for enhancing Sammi Runtime functionalities. The idea is to allow the SOM module to be accessible from a stand alone python script and provide methods for reading and writing to a display(*.fmt) file. In addition to this, updating the sammi object model to allow format, layers, shape and DDO object creation. These features would allow the ability to programmatically create new complete displays. It would also allow post verification or modification of existing displays outside of Sammi. The idea is to provide a way to associate a python script with a specific display. A specific method within the script would get called on the add-window and delete-window event associated with the format. The sammi object model can then be utilized to update shapes and display on specific events. Just as a python scripting can be associated with a specific display, it would also be possible to associate it with a custom DDO instance. The idea is that the python script associated with the custom DDO would receive DDO specific Runtime events and would be responsible for performing drawing or updating of widgets. This would provide a way for a user to create a custom DDO and incorporate it in a Sammi display. The peer application written with the current Sammi api provides a very direct and straight forward interface between the Runtime and the peer application. However as a result of this architecture, the api has limited access to the sammi object model. By exposing the runtime events within the python script, it would be possible to achieve all the functionalities that the sammi api currently provides within the python script. Furthermore, full access to the sammi object model would allow additional means by which to manipulate format objects.